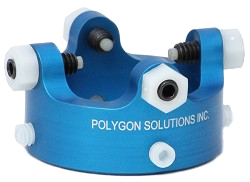 The rotary broach brake is a simple device used to keep the broaching spindle tight enough to hold orientation, but loose enough to allow the spindle to turn while broaching. 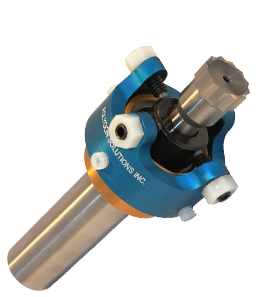 Some experience with rotary broaching is helpful to determine the right amount of pressure required. Will not fit GT-150-A or GT-150-B. Slide the brake onto the tool holder. Line up the spindle tightening screws to the edge of the spindle. Fasten the brake to the holder using the nylon set screws. Do not over-tighten. Note: Using metal set screws may squeeze the body and damage the bearings. Turn the spindle tightening screws until the pressure on the spindle is relatively tight but loose enough that the spindle can rotate when in contact with the part. Bring the broach to the edge of the part. Align the broach to the desired orientation. Bring the broach into contact with the work piece, so that the broach will rotate with the work piece. Ramp up speed and feed to desired rates. Stop turning before removing the broach from the hole. The broach brake should be tight enough to hold orientation until the next part is ready.